There was an article (here) in yesterday’s Frederick News Post about Frederick area food bloggers. It failed to mention this site, yes loyal readers not a peep about Fred Foodie. Oh the horror! The humanity! The snub! I pity the next restaurant I review. It will be ugly. The food will taste like crap! Of course since sarcasm doesn’t come across well in the printed word I must now say that I am kidding. It’s a neat article. On the page are the links to the blogs mentioned. I will have to check them out. I have to admit that I was alarmed to see that there is a Frederick Foodie blog. Will lawyers have to get involved? The Bombay Grill (on North Market Street) has been serving the best Indian Food in Frederick for years. Their lunch buffet has long been a favorite. I think over the years I have filled up three of their frequent luncher cards. I must admit that I haven’t been there is the last six months though. Yesterday a friend of mine, and lover of Indian food, said that they have changed management and in her opinion the food has gone downhill to merely average. Anyone have any comments on this? I shall investigate and report back in the future. Tagged as Food, Frederick, Indian, Restaurant- misc. One of my absolute favorite restaurants in Frederick is Isabellas. Isabellas is a tapas restaurant located on North Market Street in the heart of downtown Frederick. For those of you have been living untouched by current restaurant fads tapas are essentially little plates of food. You order several to make a meal and get a whole pile of them when you are with a bunch of people. I love it because you can try so many different things a little bite at a time- think of it as foodie ADD. At Isabellas the quality of the food is very good- I’ve never been disappointed eating there. Not all of their dishes are stars, but the beauty of tapas is your never stuck with more than a few bites of any dish. Also check out their website, they have a lot of specials and different events such as tasting nights, wine dinners, 1/2 price bottles of wine on Tuesday. They’re also good for lunch. They have a limited lunch menu where you can get three tapas, within 10 minutes for $10. Service: 89. The servers are polite, competent and keep everything in order. They are knowledgeable about the dishes. The food also comes really quickly (unless you order paella which takes a long time to prepare). Ambiance: 90 or 75. The restaurant is in a beautifully restored old building, with lots of exposed brick and pleasant artwork. There is also a fireplace in the back. Its truly a nice space. However, and this is the reason for the bipolar rating, it has a large bar. Normally there are very few or no people at the bar. But if you go there during happy hour (especially on Fridays) then it can be really loud and crowded. The crowd from the south side of the bar can spill into the dining tables. Food 92: The full menu has probably 3-4 dozen different tapas so you are sure to find something for any taste. 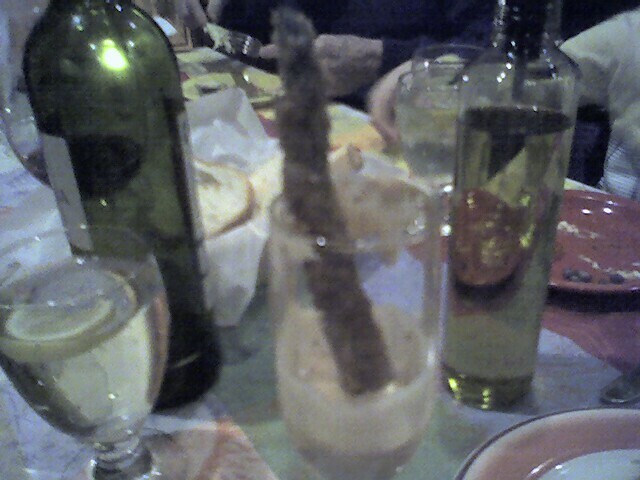 The standout, must have every time I go, is the panko encrusted deep fried asparagus spears. These are served 4-5 to a serving in a champagne flute with a thousand-island ish dressing in the bottom of the flute. They are simply delicious and worth the trip alone. The empanada del dio are little filled pastry pies. Their filling changes daily, but they are always good. Also had the goat cheese fritters (yummy) and the green beans drizzled with garlic and white truffle oil. Lots of flavor and the beans were cooked perfectly. The only less than stellar dish was the pan seared rockfish on a potato-mushroom pancake with pomegranate-saffron butter. The components were delicious: the rockfish perfectly done, the pancake interesting and a nice contrast to the fish and the saffron-pomegranate butter was delicious as well. However the rockfish was just way too salty, bordering on inedible. It was a shame because it would have been a stellar dish. Drink 88. Except for the one time we went there and they were out of rum (I thought the server was joking with me: I told him very funny now bring me my mojito, but the whole restaurant and bar was apparently out of rum!) Isabellas has always done well in this area. They really emphasize wine with tasting menus, winery nights and discount bottles on certain nights. However this past visit I noticed noticed a significantly pared back wine list. I asked the server about this and she said they were streamlining things. I was unhappy to see the Barahonda Monastrell gone from the list. However we did order the 2005 Castano Hecula which is a decent wine. They also have about a dozen reds and whites by the glass. If you have room try the flight (3 different varieties) of sherry for dessert. For those of you who think sherry is just for little old ladies, this will be an eye opener. Value 82. Average. Not cheap, not expensive. One of the neat things about tapas is you can order some, and if you’re still hungry order some more. The wine was $28 for the bottle which is about 2 1/2 times the retail price. Hope this is enlightening. As always your comments are welcomed. Tagged as Food, Frederick, isabellas, Restaurant- misc. Check out their website and their magazine. It had a lot great information of interest to local foodies. It was also interesting to see that this is part of a national community of these magazines. It is published quarterly so I look forward to the winter 2007 edition. I heartily recommend tracking down a copy or subscribing.